-Classification type: Modern Contemporary Sofa. 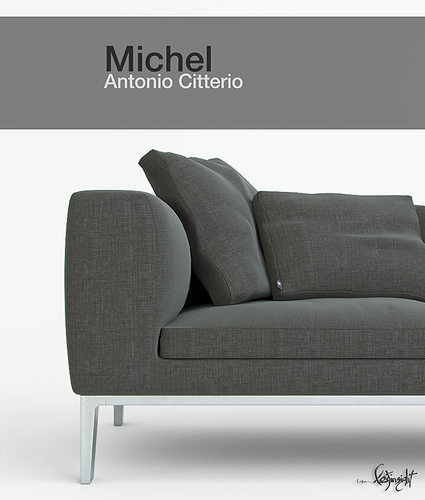 -What's inside: A High Quality 3D model of Michel sofa and detailed enough for close up renders with HD maps. Light 3D models that is ideal for mixing into large files. - Two different materials for the fabric surfaces. -Polygonal modeling is excellent with a small polygon count. -Excellent sofa design and it is ideal for modern contemporary interior scenes. Model is scaled in real world measurements. - With over 7 realistic materials and HD maps. - Studio scene Set-up is not included. - 2.2 gamma material generated. 3D model size: 4.028 MB. \"All Lostinsight3D products are created with care and quality.\"
-Compatible with 3dsmax 2009 UP to the current version and vray 1.5 UP to the current version.